Montreal's public transit system is run by the STM, which stands for Société de Transport de Montréal, the agency responsible for operating the city's bus and Metro* services. And it has a fairly good reputation in the commuting department in terms of coverage. Residents echo the sentiment with frequent public transit use. Despite a declining pattern in public commuting over the last twenty years, the latest Census figures show that 22.2% of employed Montrealers use public transit to get to work (and more than half of downtown workers commute), the highest proportion in Canada after Toronto, a city with a 23.3% ride-to-work rate. With the lowest personal car ownership rate in Canadian and U.S. cities as well, one-third of Montreal households don't have cars at all, suggesting a possible trend toward sustainable modes of transportation. But it's not just about coverage and convenience. For many Montrealers, it's a bottom line issue. Montreal is, by economic measures considered, a poor city with the lowest recorded GDP in North America when compared to other major metropolitan areas. Thus, every penny ostensibly counts with commuters saving thousands a year in transportation costs and in a position to claim tax credits on their federal tax returns. For others, it's arguably an environmental concern knowing buses spew out nine times fewer greenhouse gases than cars and electrical-powered subways cause even less environmental damage. It's also a lifestyle choice. Less car use often equates with a more active lifestyle accented by more walking and biking from Point A to Point B. Using STM public transit instead of a car can equal thousands of dollars in savings. The modest tax credit granted to commuters on federal tax returns doesn't hurt either. OPUS, a smart card in circulation since April 2008 with transit technology comparable to that in San Francisco and Paris, is a convenient way to stock up on STM's fare plans, not to mention mandatory for access to monthly passes and reduced rates when purchasing 10 one-way trips in one shot. The OPUS card is built to last at least four years if handled with care. But if you can remember, ask for a plastic OPUS casing at any manned metro station cubicle and insert your OPUS card in it for safekeeping and everyday usage. It's designed to protect the OPUS microchip from damage thus extending the card's life expectancy. The OPUS card costs $6. Special fare OPUS cards with photo I.D. vary from $6 for children under age 12 to $15 for students ages 12 to 25 and seniors ages 65 and over. *Parents, after presenting a valid transit pass, can bring along up to five kids ages 12 and under without additional charge on weekends and legal holidays. **Students ages 18 to 25 benefit from monthly and four-month monthly rebates identical to seniors and students under the age of 18 but all other fare packages are set at regular rates. Note that kids under 6 travel free. Kids ages 6 to 11 pay reduced rates but do not require proof of age whereas students ages 12 to 25 must use a Photo I.D. OPUS card to travel at reduced rates. ***Seniors ages 65 and up must use an OPUS Photo I.D. card to travel at reduced rates. The STM bus network is comprised of 170-day routes and 20-night circuits. Remember, if you don't already have a pass, have the exact fare for a single ticket if paying in cash. If you've never used Montreal's public transit system before and need help figuring out what bus is where type in your departure address and destination address (or intersection) using the STM's online service. It will propose three possible trip itineraries. Montreal's airport bus, the 747, is the most affordable and convenient way to travel to and from the airport. Find out what fare types are available here. Again, when paying on board a bus, only the following passes/payments are accepted: a fare-filled OPUS card, a valid transfer pass, a valid pre-purchased paper pass or exact change to cover a single one-way fare. A lesser-known public transit alternative, taxibus services are available in select areas of Ville St. Laurent, Lachine's Industrial Park, Île Bizard, Senneville, and other locations lacking adequate bus and/or metro coverage. Users generally call the taxi company in charge of a given area ahead of time and simply need to show their magnetized pass or OPUS card to the taxi driver. 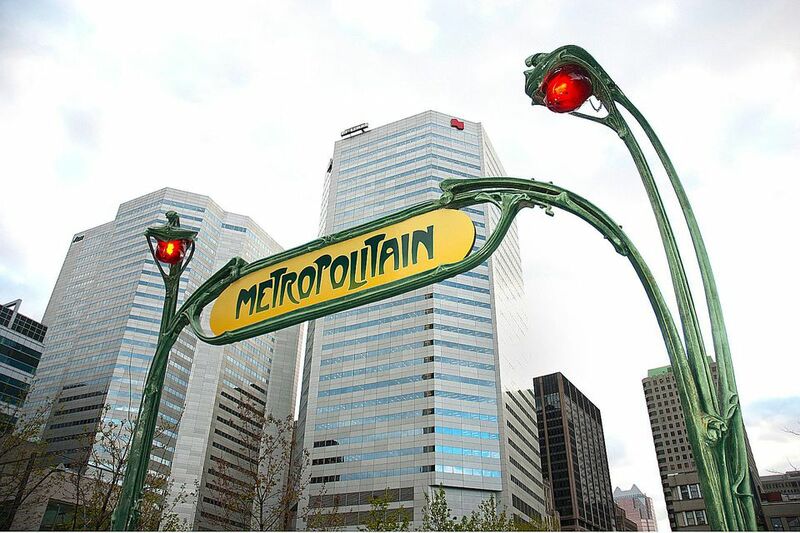 Montreal's underground subway system, better known as "Metro," is easy to use. Composed of four underground transit lines, as illustrated on the STM Metro Map, they are always referred to by color: the Orange Line, the Green Line, the Blue Line, and the Yellow Line. Find out what fare types can be purchased here. If you've never used Montreal's public transit system before and need help getting from point A to point B, type in your departure address and destination address (or intersection) using the STM's Tous Azimuts service. It will propose three possible trip itineraries. You can also consult the following series of STM maps. Using the metro turnstiles is relatively straightforward. With an OPUS card, simply place the card on the top part of the turnstile that looks identical to the OPUS card but bigger (don't try to insert it anywhere). A light above the OPUS plate will turn green and beep. Remove the OPUS card from the plate and pass through the deactivated barrier. With a magnetized paper pass, simply pass it through the slit on top of the turnstile, which should then beep, indicating the barrier is deactivated. If a magnetized pass is demagnetized but still valid, use the turnstile to the far right, beside the STM employee booth. Show your valid pass to the STM employee and they should let you through. Some demagnetized passes can be exchanged for fresh ones at the Berri-UQAM metro station. Ask the employee if your particular pass applies to the rule. Montreal is also equipped with five commuter train routes, a welcome, time-saving commuting option for off-island residents and suburbanites: three train lines service the North Shore and two go to South Shore destinations. STM does not operate the train service. Rather, that's the responsibility of the Agence Métropolitaine de Montréal. Consult the AMT website for commuter trains or call (514) 287-8726 or toll-free at 1 (888) 702-8726 to speak to an AMT representative for more information. STM Paratransit services are open to residents with disabilities limiting mobility significantly enough to hinder the ability to carry out normal activities. To find out how to apply for and use Paratransit services, consult the STM Paratransit Service website or call (514) 280-8211.